Estimating rates of biogeochemical processes in the ocean. 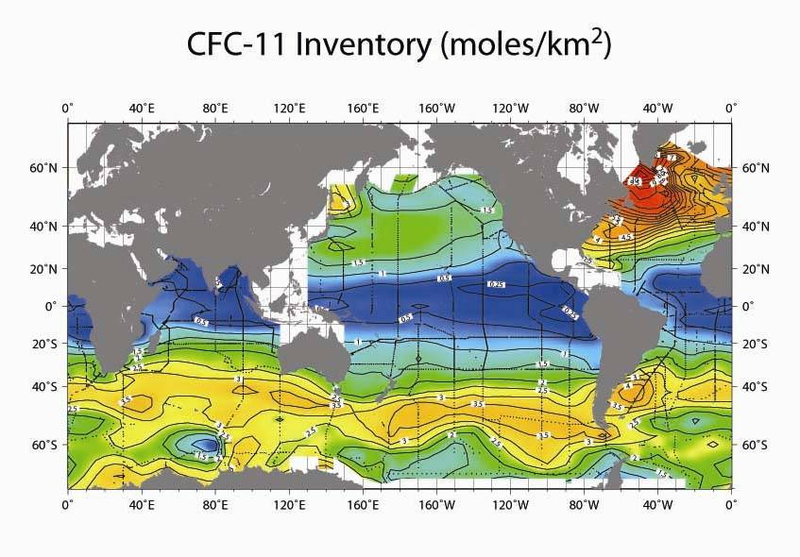 The Figure at top of page shows column inventory of CFC-11 (in moles km2) based on WOCE data (Willey et al, 2004). Click the image to see the full size figure. Station locations where CFCs were sampled are shown as black dots. This figure highlights regions of strong ventilation and storage of atmospheric gases occurring on decadal time scales. CFCs can be used to estimate water mass formation rates and improve estimates of the oceanic sink for CO2. Data from repeat surveys have allowed estimates to be made of changes in the rate of formation of GSDW and LSW on decadal timescales. The figure below, (Kieke et al, 2007) shows changes in CFC-12 inventories between 1997 and 2003 in ULSW (left in figure below) and LSW (right in figure below). 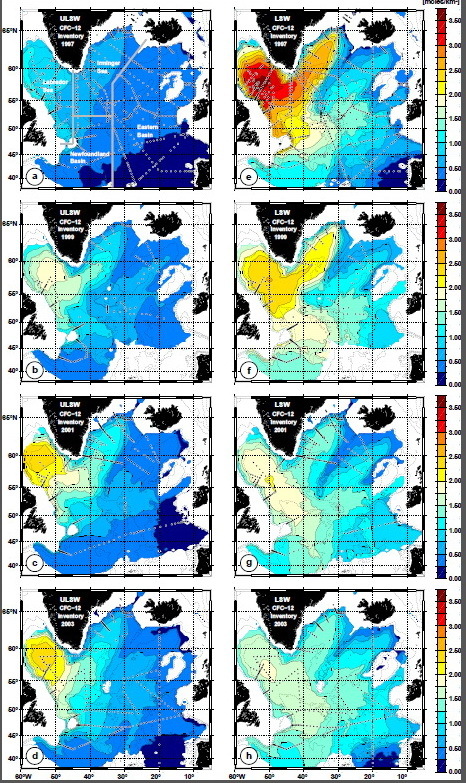 Results reveal that the lighter ULSW formed since the mid-1990s has started to replace the large pool of the deep LSW stored in the western North Atlantic. Formation of deep LSW was essentially absent in 1997–2003. Formation of ULSW compensated for this absence during 1998/99 (7.9 Sverdrup), but afterwards declined to 2.5 Sverdrup. Changes in CFC-12 inventories between 1997 and 2003 in upper LSW (ULSW) and deeper ‘classical’ LSW. See PDF of full size figure. Orsi, A.H., G.C. Johnson, and J.L. 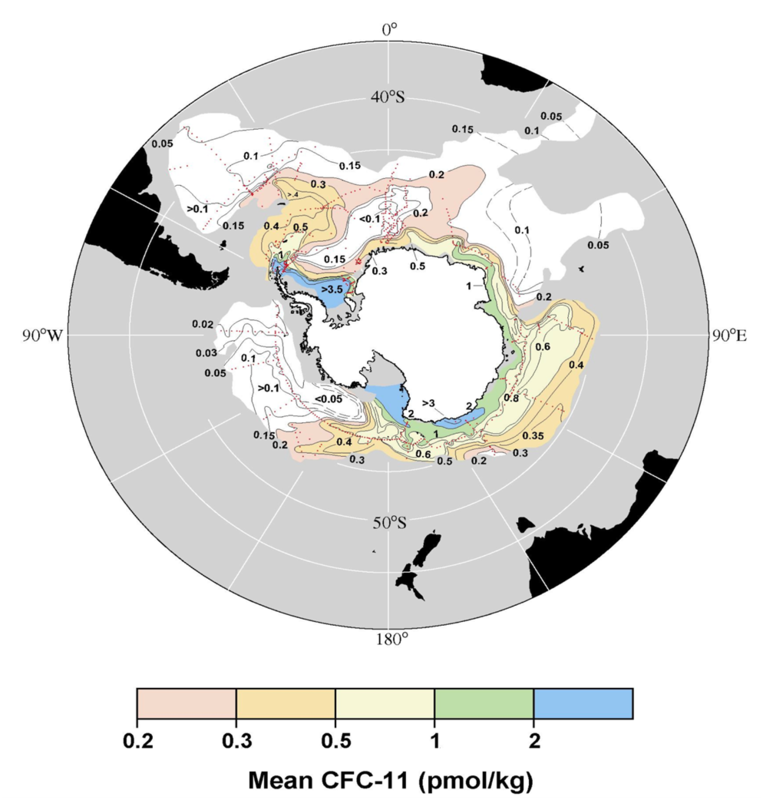 Bullister (1999): Circulation, mixing, and production of Antarctic Bottom Water. Prog. Oceanogr., 43(1), doi: 10.1016/S0079-6611(99)00004-X, 55–109. Willey, D.A., R.A. Fine, R.E. Sonnerup, J.L. Bullister, W.M. Smethie, Jr., and M.J. Warner (2004): Global oceanic chlorofluorocarbon inventory. Geophys. Res. Lett., 31, L01303, doi: 10.1029/2003GL018816. Distribution of the mean (depth-averaged) concentration of dissolved CFC-11(in pmol kg-1) in the layer of dense Antarctic Bottom Water (AABW). The calculated CFC inventories can be used to estimate the formation rate of AABW. From Orsi et al. (1999). Click image to see full figure.